Today’s post was written by Hannah Steinfeld and Yanilsa Frias. Hannah is a Sociology major and communication disorders and deaf studies minor at Ithaca College and is pursuing a career in special education as a teacher. Yanilsa is a Business Administration major with a concentration in Marketing at Ithaca College and is pursuing a career in the banking industry as a financial analyst. Picture this: Having to present showroom plans to a major designer in Manhattan at 3 p.m., but also facing a 45 minute train commute home to transport a child from school to her neuro-psychological assessment. This type of conflict is typical for all working parents, but is especially problematic for women, such as my mother*, who raise children with special needs. This disability took an emotional, mental, and financial toll on my family who had to dedicate much time and effort to ensure my needs were being met. My mother was responsible for taking me to multiple professionals for psychological and diagnostic tests, in addition to attending my Individualized Education Plan update meetings. The process of parenting a child with special needs took time away from her career to focus on ways to benefit my academic success. The challenges my family faced raising a child with disabilities demonstrates the division within the work-family spheres. About one in four American households with children will have one or more children with special needs at some point in their development. These needs can range from mild to severe and can be physical, mental, or both. 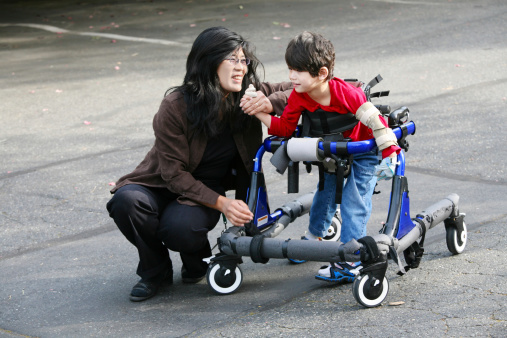 Some children are born with disabilities and others develop them. While the concern of caring for children with special needs affects all parents, the toll on careers tends to be most pronounced for mothers. One in four special needs children live with single mothers. Single mothers, especially those who only have one source of income, struggle the most when raising children with disabilities. In 2002, a single mother with a young child with disabilities was 17% less likely to work full time compared to a single mother with a young child without disabilities. Mothers of children with special health care needs usually assume the role of the primary care provider, viewing this responsibility as an “informal career.” In contrast, fathers in these families gravitate to the workplace and adopt the role of financial provider. In the event of divorce, children with special needs are five times more likely to live with their mother than with their father. As a consequence, single mothers experience high levels of stress. In part, stress can come simply from unforeseen events that stem from having a child with special needs, resulting in mental, emotional, and financial demands. However, inflexible or low quality employment can compound these difficulties. My family had the benefit of two parents and a middle class income. Children with a disability are often born into low-income families, and families who care for children with a disability often slide into poverty. According to Census 2000, poverty rates among families caring for children with disabilities are 21% higher than families who do not have children with disabilities. Again, while their children’s special needs present strains, employment quality has a significant impact on access to the resources needed to meet these challenges. This can present a vicious cycle, with limited resources escalating caregiving demands, and escalated caregiving responsibilities undermining capacities to engage in dependable work. While women in general are less likely than men to work full time, women with children with special needs are even more likely to work part time or drop out of the labor force entirely. How can our society reconstruct the dichotomy between work and family sectors? Workplace support will be a key element for these families with special needs children. Employers need to be more flexible by redefining their expectations of the ideal worker, and when possible provide other supports such as day-care services, paid leave, and flexible schedules. For example, providing onsite day-care prevents the stress and anxiety that derives from the uncertainty of their child’s safety and care. If organizations do not offer these accommodations onsite, then they could potentially contract with vendors to provide these services. This would make the process of looking for day care arrangements more efficient for parents. Paid leave and flexible work hours should be implemented to ensure parents could properly care for their child with special needs both financially and morally. Flexibility includes but is not limited to paid vacation and sick days and parental leave. In addition, the fluidness of the work schedule enriches employee productivity, in and outside of the workplace. As a society, we should be more conscious and accepting of diverse family dynamics. But beyond employer-based initiatives, families need the support of the wider society. It takes a community to raise a child with or without disabilities. Excellent piece in terms of continuing to raise the level of awareness and discussion about the challenges facing working mothers — and fathers — caring for children with special needs. The work/life struggles are what we refer to as “chronic and crisis” and require many parents to have to choose between being a good employee or a good parent, a choice no working parent should have to make. Helping companies support this fast-growing segment of the workforce is essential, both for business and working parents. For companies, it involves issues of recruitment, productivity, and engagement. And for working parents, it involves being able to meet the needs of their children, many of whom will be tomorrow’s employees and leaders in every industry. If childcare and elder care issues are supported, so too must be these issues. Thank you so much for bringing awareness to this issue. As the parent and primary caregiver of a special needs child fir the past seventeen years I felt I had no other option but be a stay at home mom. While I loved being home with my children it definitely took a tremendous toll on the family financially. While we were not ” well off” by society’s standards we were lower middle class and getting by ok. But it became clear immediately that my working was not an option. And every year took us deeper into financial hardship. We were forced to turn to taking out small loans to keep our bills paid. So we spent year to year borrowing from Peter to pay Paul. Now with the economy in terrible shape we have sunk into poverty and I spend every day racking my brain trying to figure out a way for me to work so I can help bring in a second income. While our son is seventeen now and in high school and in main stream classes it is still complicated. He has short term memory loss along physical and cognitive disabilities and cerebral palsy. I attend all his IEP meetings to make sure he is getting treated fairly academically as well safety wise. I also get him to all his doctor appointments to his many health professionals as well as therapies. I spend so much time running from school to appointments and then the fact that my son cannot be left unattended after school makes it difficult to figure out a way to work. I feel defeated and depressed and can’t see any way to make our situation better. Again thank you . @Sbeila This is three years late,but I just read this article. I have three kids,two on the autism spectrum..one of which has high anxiety issues as well.Anyway I took a part time job at McDonald’s..and while it’s not great pay,they are GREAT with limited availability. So if you are looking at a way to bring in a supplemental income, I would recommend it. We are disabled. It breaks my heart often. Wow, I have been struggling for so long with these same thoughts. This is the first time I have felt like I have found someone who is experiencing the same challenges. It is frustrating to feel so limited! My husband works two jobs to try and make ends meet. I work at a school as an aide so that I am on my daughter’s schedule. But, pay is lousy with no benefits. My daughter is aged out of daycare, too young for adult programs, but cannot stay home alone. Our income is very limited and we keep falling further behind financially. I spend so much time and energy trying to figure out how I can be a good mom, wife and provider for my family! It is exhausting and depressing!